During the summer months, a lot of stuff still goes on here on the Hilltop. With summer classes, freshening up buildings and lawns, and welcoming new Mustangs to campus, it’s a busy time! OIT has been hard at work on several initiatives this summer, with one resulting in a brand-new web site. The new OIT site has a fresh new design and gives you quicker access to the information you need most. With custom pages for students, faculty, staff, and parents, help is only a few clicks away. We have also updated and organized our service catalog so you can learn about all of the software and services available to you. There is also a new classroom information page with details on all classrooms with a search feature that can find the perfect room for your needs. 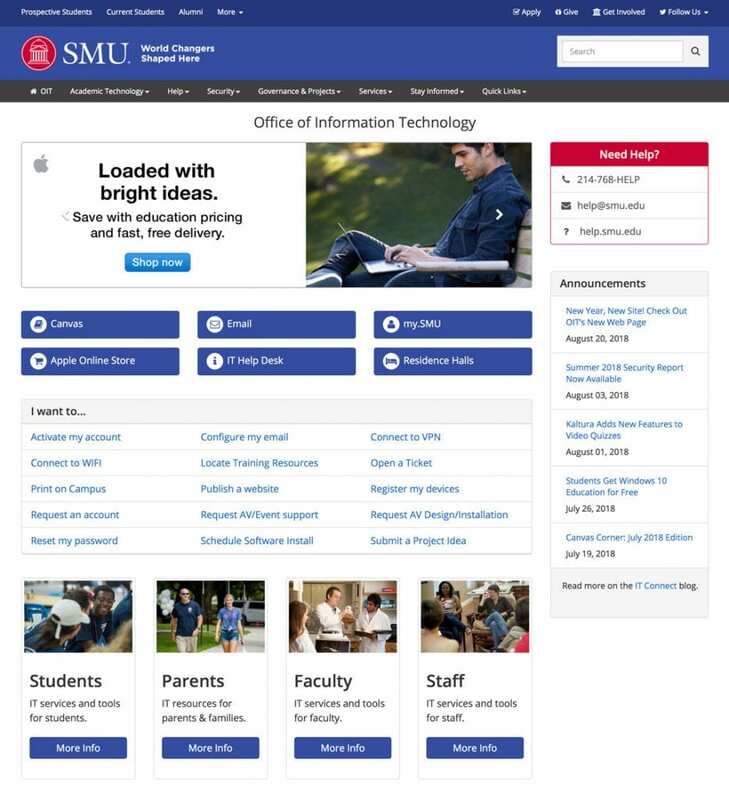 The new home page for SMU OIT.